Your first reaction might be something like: Why would I eat something bitter? That’s a great question. Let me explain. The bitter flavor can work magic on a “lazy” gastrointestinal tract. What I mean is that if your GI doesn’t make enough stomach acid and saliva, doesn’t secrete enough enzymes and bile, doesn’t move food through the intestines at an appropriate pace, or just doesn’t send the right hormonal messages for optimal hunger and satiety, then bitters might help you out. When we taste something bitter, it doesn’t have to be much, our neurological system sends all the messages to rev up the digestive system. Many of us have eaten a diet lacking this flavor which in a way has atrophied our GI tracts. So embrace the bitter flavor! And the other question: Why are you trying to make me eat a weed!? Eat the weeds! Brigitte Mars, an extraordinary health professional, reminded me more than once that the weeds have endured and adapted through much hardship. We could eat these strong, adaptive plants or we could rely on feeble conventional crops that wouldn’t thrive without constant care (and pesticides/herbicides/fungicides). Like Emerson points out, we pass judgment and call it a weed before we take the time to get to know the plant. That is all conceptual and romantic I know, so let’s look at the nutrition in dandelion leaves. Dandelion has ton’s of antioxidants (check out the video above from NutritionFacts.org) and TONS of Vitamin K. It also contains excellent amounts of Vitamin A and phytonutrients like the flavonoids zeaxanthin, carotene, lutein, and cryptoxanthin which are great for protecting us from UV damage to the eye and cancers of the lung and mouth. It may also help kill leukemia cells and stop melanoma growth. And we’re learning so much more! 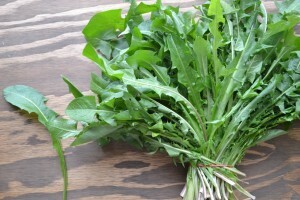 So when those young dandelion leaves come up in the spring, pick them, don’t spray them. Remember that they’re most tender and less bitter as a young leaf before the plant flowers (but I use the mature leaves too . . . and the root . . . and the flower). 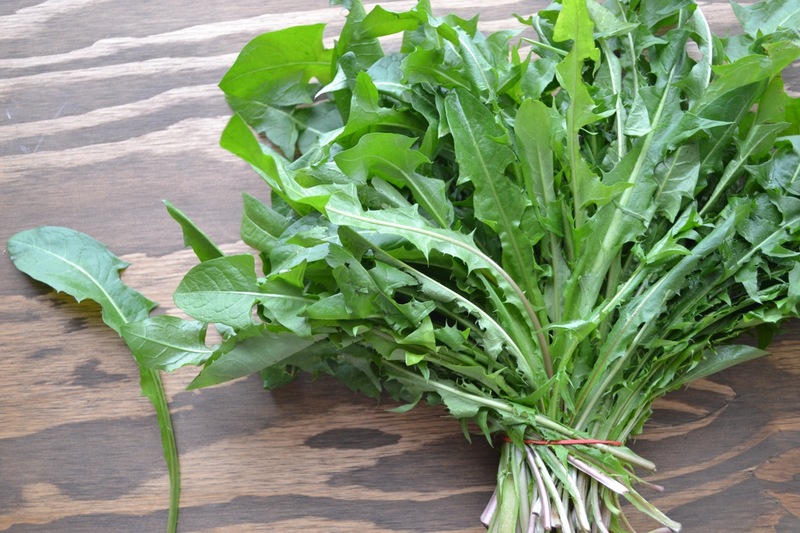 Check out Brigitte’s videos about Dandelions and Urban Foraging and learn all about the edible plants that are growing wild in your lawn! Chatterjee SJ, Ovadje P, Mousa M, Hamm C, & Pandey S.. (2011.) The Efficacy of Dandelion Root Extract in Inducing Apoptosis in Drug-resistant Human Melanoma Cells. The Journal of Evidence-Based Complementary and Alternative Medicine, 2011:129045. doi: 10.1155/2011/129045. Ovadje P., Chatterjee S., Griffin C., Tran C., Hamm C., & Pandey S.. (Jan. 7, 2011). Selective Induction of Apoptosis Through Activation of Caspase-8 in Human Leukemia Cells (jurkat) by Dandelion Root Extract. Journal of Ethnopharmacology, 133(1):86-91. doi: 10.1016/j.jep.2010.09.005. Add the onion and cook until soft. About 5 minutes will do. Add the garlic and stir. Allow it to become aromatic. This will take about 45 seconds. Add the shiitake mushrooms, sunflower seeds, balsamic vinegar, and paprika. Stir and let cook for about 2 minutes. Finally, add the dandelion greens and cover. This will let the leaves steam and wilt. Don’t wilt too long, just enough for the leaves to turn dark green and soft. About 2 minutes will do. You may need to stir a couple of times so all the greens wilt uniformly.